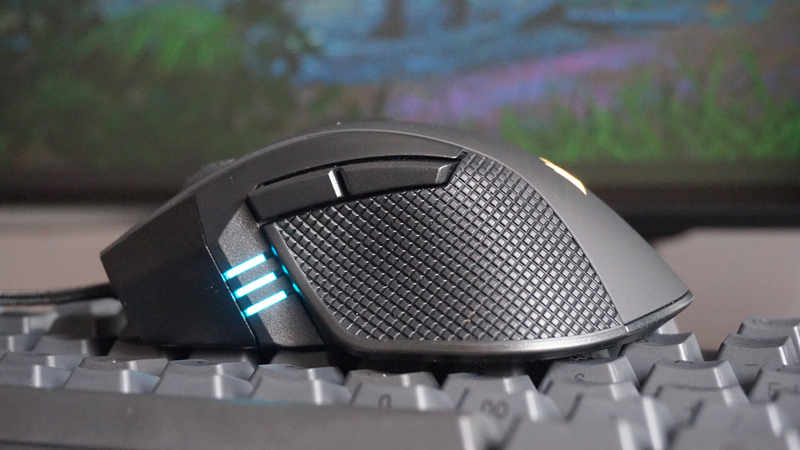 It’s not often you see a gaming mouse tout itself as both MOBA and FPS material, but the new Corsair Ironclaw RGB is one such genre-crossing clicker that hopes to combine the lightweight precision of so-called FPS mice with the overall long-term comfort of their MOBA-based cousins. And man alive does it succeed. Now, I’ve always been a fan of a more full-bodied mouse that lets me indulge in my favourite lazy palm grip, but they also have the annoying habit of being a bit too heavy for my spindly girl fingers. 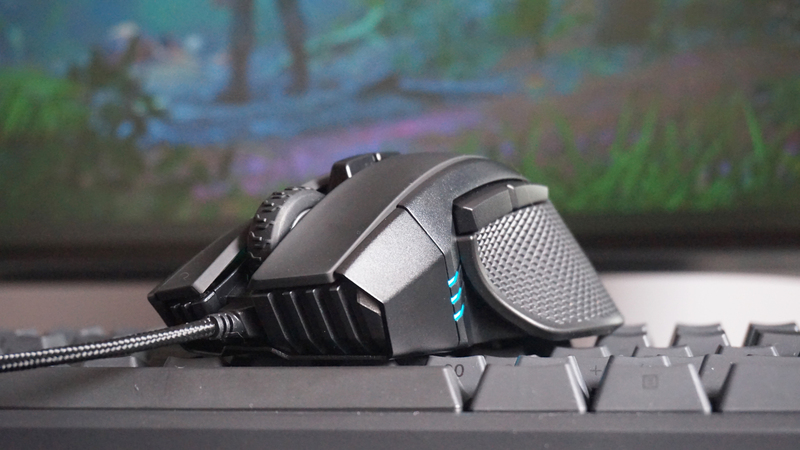 The chunky Roccat Kone Aimo, for example, is just about doable at 130g – especially after years of using the 115g bronze oven mitt that is the Steelseries World of Warcraft Cataclysm mouse after I inherited it when I started my first tech job – but really I’m more of an 80g Logitech G Pro Wireless kinda gal. The Ironclaw RGB isn’t that light, admittedly, but its sculpted 105g chassis certainly feels a lot more sprightly in the hand than most mice of this size. That’s partly because it’s such a lovely thing to hold. Its right-handed contours sit wonderfully under my palm, for example, and its textured thumb groove provides the ideal resting spot just underneath its two chunky and easily-reachable side buttons. It also looks and feels a lot more like a £55 / $60 mouse than our current mid-range champion in our best gaming mouse line-up, the Steelseries Rival 310. For starters, it comes with a 1.8m braided cable instead of a smooth plastic one, and the rubbery soft-touch finish that covers the main spine of the mouse adds an extra touch of class that feels infinitely more pleasant against your skin than the plain plastic body of the Rival. The black diamond-textured pattern down each side also looks more elegant and likely to last than the Rival’s grey rubbery grips. 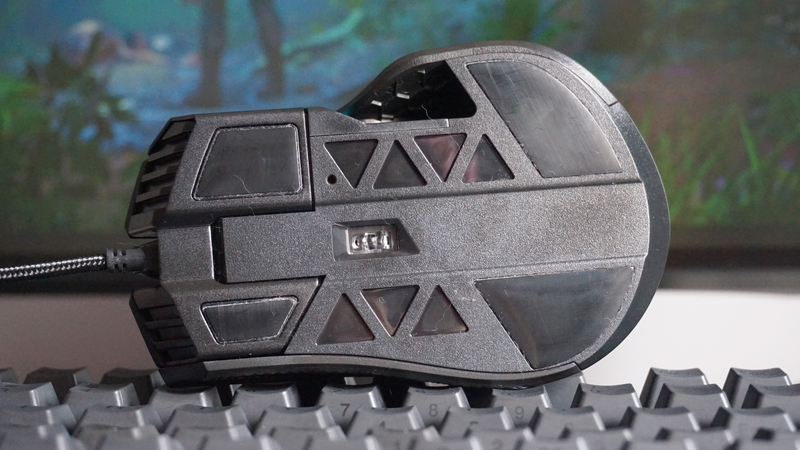 The Ironclaw RGB isn’t just a better-looking gaming mouse than the Rival 310, though. It’s also more flexible. Whereas the Rival 310 has six programmable buttons and a DPI / sensitivity range of 100 – 12,000, the Ironclaw RGB has seven programmable buttons and a DPI that stretches all the way from 100 – 18,000. Not that you’ll ever need that extra 6,000 DPI, mind, as most normal human eyeballs (or mine, at the very least) can barely keep up with anything over 3,000 DPI. What you can do, though, is use Corsair’s more sophisticated iCUE software to set the Ironclaw RGB’s trio of DPI presets to literally any number you like within that frankly ludicrous range, whether it’s a dead slow 106 DPI, for example, or a nippy 1573. None of this being limited to increments of 50 or 100. Just type it in or use iCUE’s easy slider interface to get exactly what you want and job done. The Rival 310, on the other hand, only gives you two DPI speeds to choose from in increments of 100. That’s not all, either, as iCUE also gives you a greater range of customisation options for the Ironclaw RGB’s seven programmable buttons. By default, the two central buttons below the scroll wheel toggle between its aforementioned trio of DPI speeds and its three onboard profile settings – the latter of which are handily highlighted by three little LED strips just in front of your thumb. The side buttons, on the other hand, act as forward and back controls while surfing the web, but you can swap all of these out for a variety of different options, including recordable macros, text commands, media shortcuts, and even remap Fn or other keyboard shortcuts to them. The key feature for me, however, is that you can assign the Ironclaw RGB a special sniper button for when you want ultimate control lining up those all-important headshots in FPS games – something you simply don’t get on the Rival 310. It’s a little hidden away, all told, and nowhere near as obvious to the eye as having a dedicated sniper button like the Asus ROG Gladius II or Logitech G502 Hero, for example, but it is there. All you need to do is assign it to a button of your choosing by selecting it from the Remap Mouse Button menu in iCUE’s Actions tab. And, of course, you can also customise the speed of that sniper button over in the DPI settings. That’s a pretty convincing package for £55 / $60, and in my eyes a much better buy than the similarly-priced Steelseries Rival 310. The Rival 310 is currently a smidge cheaper right now, going for £46 / $44 at time of writing, but that extra tenner or so goes a long way here, whether you’re after that extra level of flexibility or a comfier, better-looking chassis. As a result, the Corsair Ironclaw RGB is now my new recommendation for best gaming mouse in our mid-range price category – although those after a more ambidextrous design should still check out the Steelseries Sensei 310 if you need something left-handed. For the righties among us, however, the Ironclaw RGB is a tough act to beat for mid-range mouse buyers. Tagged with Corsair, feature, Hardware, mice, mouse.